Are you excited to go shopping in six months? First of all, don’t be fooled by that 00:00:00 countdown in the photo accompanying this post — it’s part of an email forwarded by Consumerist reader Kaleb, and presumably the ticking clock works in the offers sent to customers on the OfficeMax mailing list. 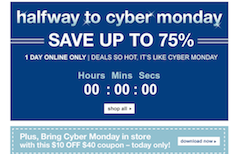 But let’s not lose sight of what it really is, at its essence, which is a countdown clock to a “halfway to Cyber Monday” sale. Yes, holiday shopping creep is a thing now and we’ll all have to deal with it. Note — at first we thought this was a countdown to the actual Cyber Monday, but Kaleb wrote in again to clarify that it was simply the minutes left until the sale was over. But it’s still a sale making much ado that we have six months left before Cyber Monday. Oof. Not only should we all apparently be ticking days off on the calendar for actual holidays like Thanksgiving and Christmas, but we should also be keeping track of how many months (six!) we have until we all get on the computer and buy more stuff than we did on Black Friday. And what’s better to celebrate this breathless anticipation, this tallying of the months remaining until our lives are fulfilled through shopping than other deals on office supplies right this very moment? The rest of the email highlights other sales going on at OfficeMax, which is all well and good, but do we have to peg every sale to a holiday, or in this case, a future holiday sale? We have so many questions. Promotional sales promoting future sales must be some kind of weird Inception dream state and we’re now very afraid we’ve fallen into it.